The setup for the assignment was to pull three words. 1 word for an accessory, 1 for a verb and 1 adverb. 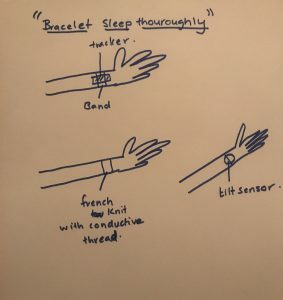 After the quick round of ideation during class, the idea that I settled on was BRACELET SLEEP THOROUGHLY. This seemed like a hard combination but one I could tackle using inspiration from current sleep trackers in the market. 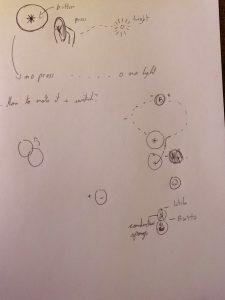 After the round of ideation, I began sketching out my initial thoughts. I decided to build a band with an attached face similar to that of a watch. After going through the list of sensors that make sense for the project. 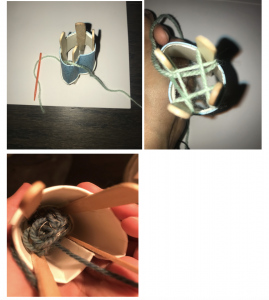 I decided to build the band using the french knit and the tracker using the circular loom to weave a tilt sensor which would be able to track moments of sleep. Most sleep apps or devices like the Fitbit use the motion sensor in the devices. The idea of creating that using completely soft material was interesting. The strategy to start building out my sensor was first to start with the band and then continue on to the weave for the tilt sensor. The one thing I was a bit confused about was how these two would connect. The idea of the french twist as a wire helped me understand the circuitry. After I had built the band my idea was to tackle the tilt sensor using the circular weaving technique. 1 french bobin or self made bobin. For this part of the process I went through a couple rounds of interactions. I did quite a few rounds of construction to understand the french knit. I used the video tutorial provided in class as a reference. At first I just used yarn before the getting to adding the conductive material. First I would recommend doing a practice round to make sure the basics of the knit are understood. 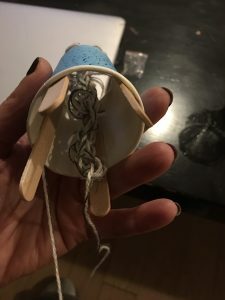 Run the yarn underneath the french bobin and twist it around from outside in on one peg and continue on to the next peg. Proceeded till you have the hang of it. I did a couple rounds before I added the conductive thread. 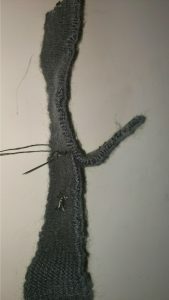 The way I knitted the conductive thread was to make the yarn and the conductive thread act as one. 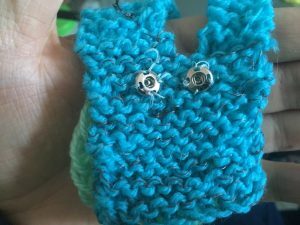 When knitting make sure the conductive thread and yarn are together. 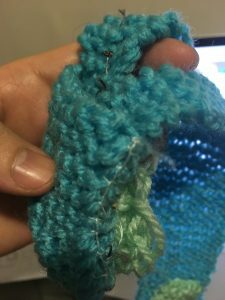 This can prove difficult when using the needle too loop one stitch over the other, be careful and make sure to get a hold of the conductive thread with your yarn before looping. Then proceed to french knit till you get a long enough loop. I then used the testing tool we had built in class to test out the bed to see if the electricity flowed. This is done when the led lights up and completes the circuit. 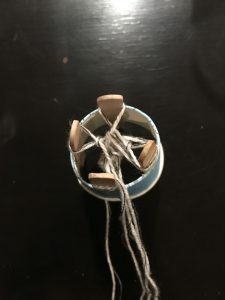 I did not have cotton string and tried to make a loom out of the yarn that I had. After failing to get the loom like structure I decided to forfeit to the loom and went back to the drawing board. I decided to build a square tilt sensor. I looked for more techniques and came across this homemade cardboard weave technique. I used https://www.youtube.com/watch?v=AWLIy-Um7_0 this Youtube video as a guiding post. Find cardboard pieces of about 3 by 6 inch piece. I used a slightly smaller one. It was harder so I would recommend using a slightly bigger piece for the ease of the needle to go through. Loop the yarn around until you have a warp structure which will be used for the weave. Mark a side as front and back. Run the yarn across to the back and paste that side with tape. I threaded half way through until I got to the middle and then I attached the conductive thread to the yarn and knitted it through the middle. Then I proceeded to test the non conductive. This would highlight the fact that the project is on the right track. For the tilt sensor to work, some of it needs to be conductive while the rest shouldn’t light up the LED on the testing tool. I continued till I got a nice pattern with the conductive piece sandwiched between the non conductive yarn. 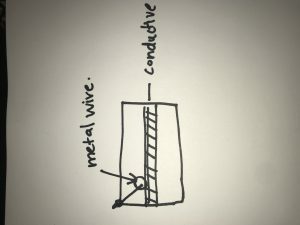 Conductive thread definitely is a great resource in building sensors. 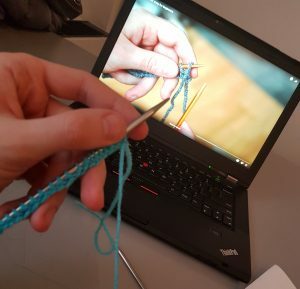 Using traditional techniques of knitting and weaving could be a powerful tool to build sensors. 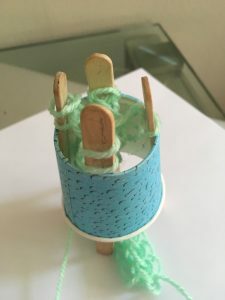 I had a hard time with the creating the circular loom, there are many resources out there that can help especially on sources like Youtube where many techniques can be found. Kobakant.com is great resource to understand how soft sensors work. The next steps that I think I would like to tackle are definitely take another crack at building the circular weave using the small embroidery loom. Another idea I had while I was building these two sensors was maybe making a pillowcase. We’ve seen a ton of sleep trackers that come in the shape of bands, because of the use of soft materials, I realized we could actually use it in things like sheets and pillowcases, into soft materials which we use in the everyday to sleep on. 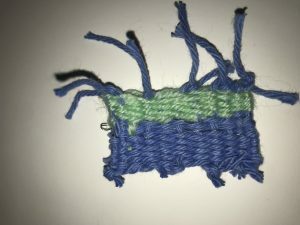 If I were to build a pillowcase I would definitely like to use the felting technique and even try out the bigger weaving pattern. My goal was to design a watch which can help to relax a person who wants to bungee jump. This watch will be worn on a hand (especially on the left hand) and squeezed to be relaxed a little bit. It is an activity that involves jumping from a tall structure while connected to a large elastic cord. The tall structure is usually a fixed object, such as a building, bridge or crane. When the person jumps, the cord stretches and the jumper flies upwards again as the cord recoils and continues to oscillate up and down until all the kinetic energy is dissipated. Although it looks like fun, it is also a very difficult activity to accomplish- especially for those who have fear of heights. Some of them who are getting ready to jump, cannot overcome their anxiety and turn back to their safety zones and step onto the ground again. 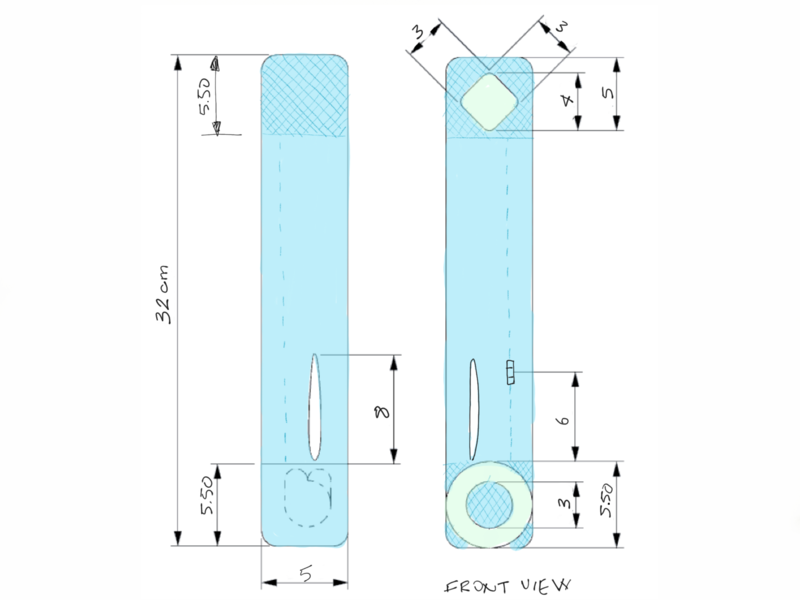 I wanted to help those who are getting ready to jump by designing a watch/hand band. It is very simple, but maybe an effective product to relax people and release their nerves. I wanted to design a product for hands, especially for the left hand. 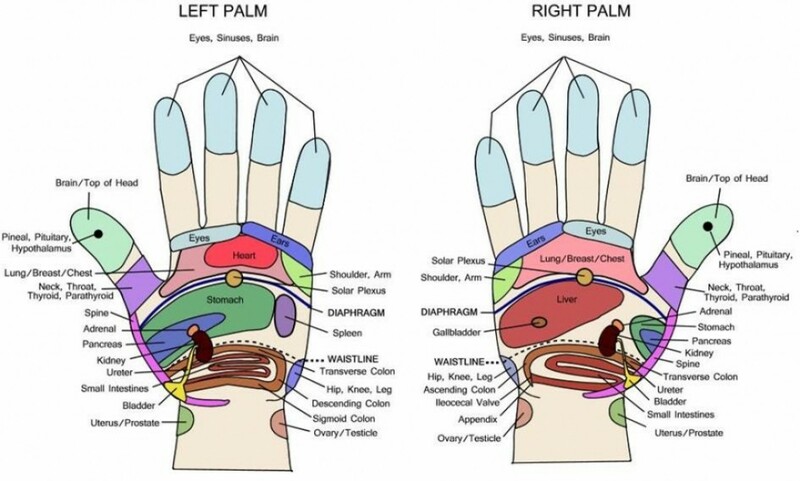 I knew that there are acupressure points on hands (including fingers and palms) to relax someone. I found that left palm includes heart, lungs, stomach, and adrenal (see image 1). A user of this product may put some pressure over there areas in the palm by squeezing the watch/hand band. If s/he presses and complete the circuit, a led lights up. S/he may play with it by lights it up and relaxes; or if s/he is very nervous s/he can squeeze it hard that it just lights up constantly. S/he also may not need to use it, if s/he feels fine about jumping of is concentrated on jumping. Even if there were no acupressure points in palms, we feel better if we hold something in our hands, squeezing our hands, or shaking them. I am giving an interactive tool to these people to hold on, taking it with their journey with. This watch/band is worn on hands and covers the palm, back of the hand. It is slotted over the thumb and wrapped around the hand. If the two ends of the band touch each other circuit completes and the led lights up. It is activated in the palm. The user has to squeeze these ends in order to make them touch each other. You can watch the video here about its usage and how it works. The slot and bands are wide and long enough to adjust the product to users’ various hand sizes. I decided the dimensions considering in hand size and comfort of usage. 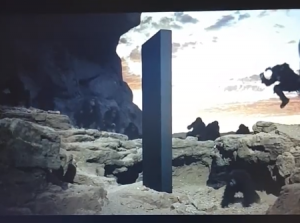 You can see the dimensions below. 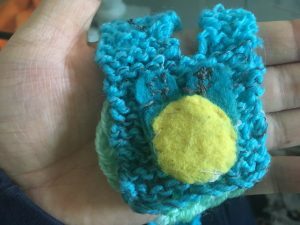 A battery is also located in the palm and it is covered with another knitted layer. Led is located the outer surface of the band, where it can be seen easily. You can see the led and how the watch is worn on a hand below. I have complete your e-textile controller/ badge using 2 techniques. One is knitting other is French Knitting. 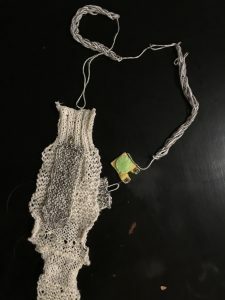 French knitting was used for the sensor, and the knitting was used for the circuit. It controls/ turns on an LED and battery to demonstrate that the circuit functions. Conclusion: A watch/hand band may be used to relax someone who wants to bungee jump. I started my project with sketches. 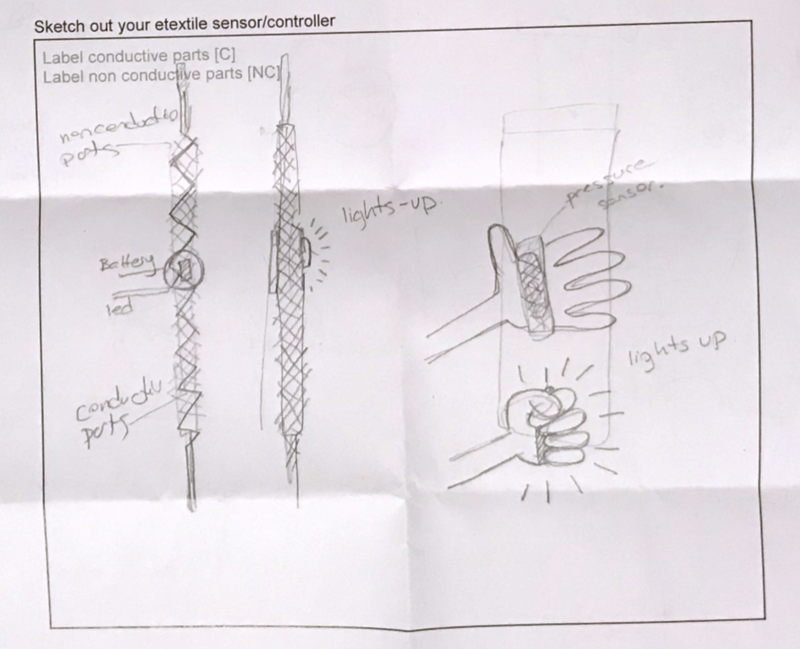 You can see the initial sketches of my e-textile sensor/controllers. 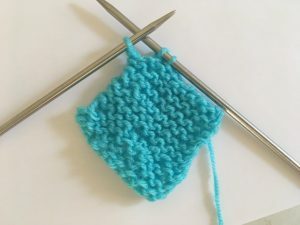 Two techniques I chose are French knitting and knitting. Starting the first loop. After a few trials, I decided to make 10 loops in a row. I also added conductive thread into the yarn. After reaching a square shape, I divided the loops into two groups. One group included six and other group included four loops. I tied the four loops with a wire not to lose them. I also stop using conductive thread at that step. 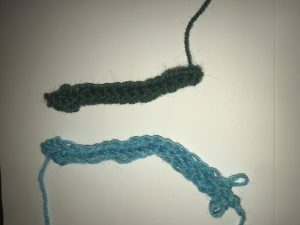 Then, I knitted the six loops to individual size. 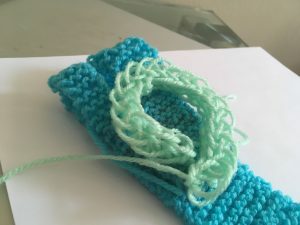 I tied the six loops with a wire and started knitting four loops. 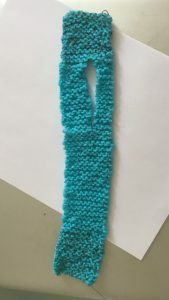 I knitted them till reaching the same length with 6 loops. 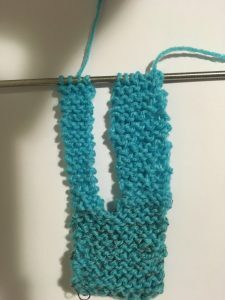 I started knitting two groups together and combined the rows together. I added conductive thread into the yard again and knitted the other end of the band with it. 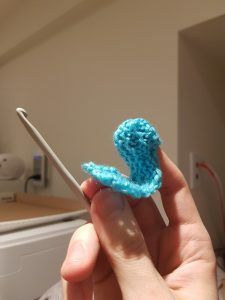 I knitted French knitting till I have enough length of it to make a button. I create a circle on the one of the end of the cord. I saw the circular French knitting on to the body with a regular thread. 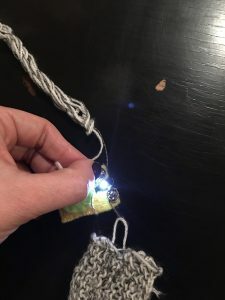 I sewed snaps for the LED. I also sewed snaps for the battery and placed the battery case on. I disconnected the snaps from each other and connected them with the rest of the circuit. 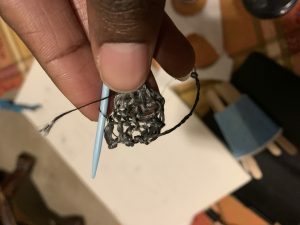 I also connected two ends of the watch/band with the conductive thread. I knitted another square piece to cover the battery and create another layer between palm and the device. I sewed the new layer and covered the battery. It looks like a pocket for the battery. 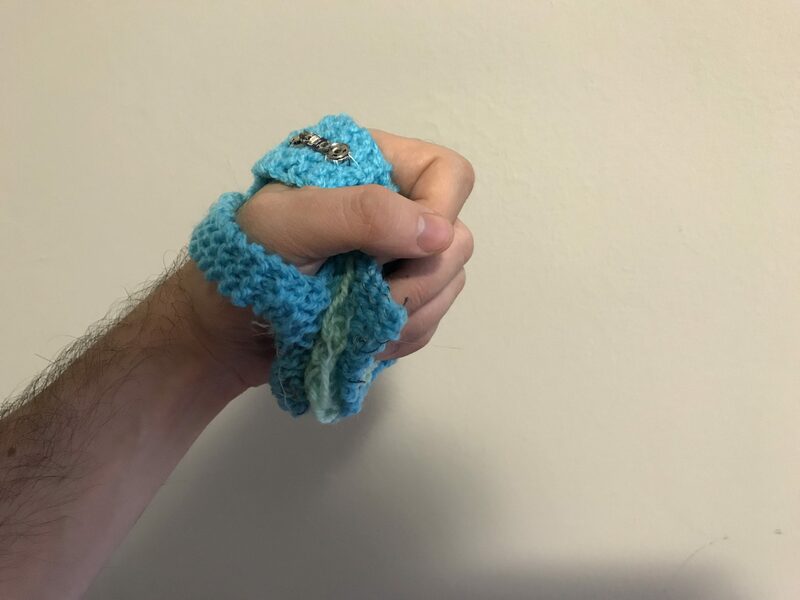 I also knitted and sewed a small piece onto the end of the band where fingers are located. I thought it can be a sign of the button and shows the real button underneath. I learned how to make sensors and push button. 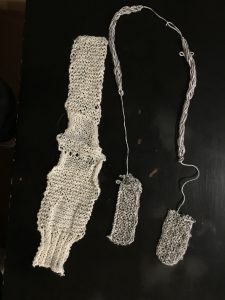 I learned and practice two kinds of knitting. I practiced how to complete a circuit. 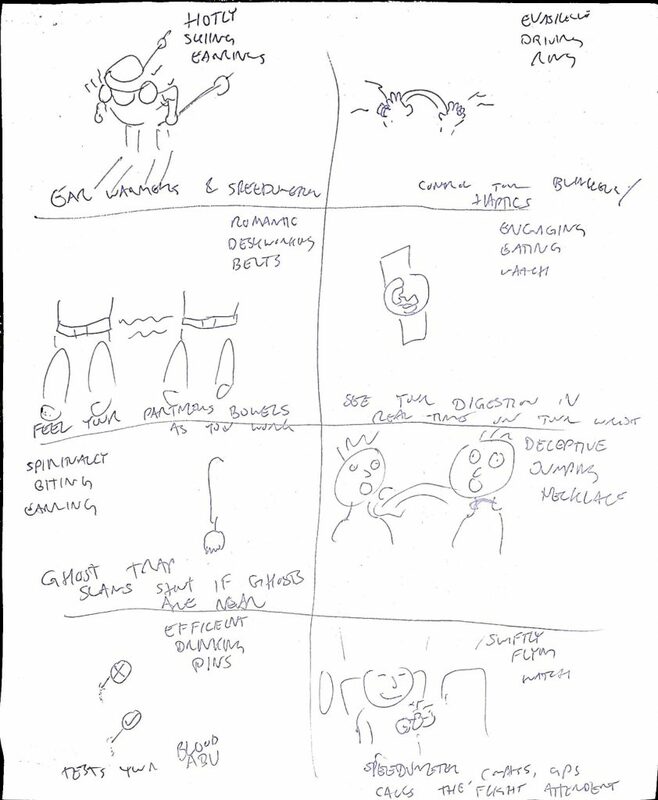 I learned another method for quick and effective brainstorming. I placed the batter after knitting and the area where I located the battery was on the conductive thread. It took some time to clean the threads between the snap because it looped a lot between snaps. I recommend to decide where you locate the components before starting, otherwise, you can strive unnecessarily. Information sources: I used this video to learn how to end knitting of the last row. 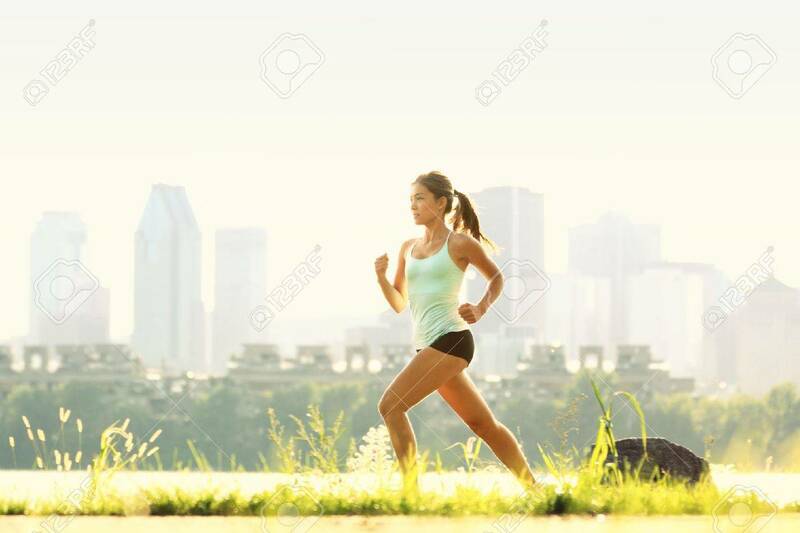 Running, as a form of exercise can help reduce anxiety and stress, but running in urban areas can often be a source of stress as well. Loud honking cars, pollution, careless pedestrians, and unexpected weather conditions can weigh a runner down. The Relaxed Runner is a set of wearable devices aimed at helping runners address some of the stressful situations they encounter on the go. A controller, worn on the runner’s fingers is connected to a scarf around the runner’s neck and triggers specific features. The scarf contains a speaker, to help cut noise when needed, LED lights to help runners signal pedestrians and traffic (especially when running in the dark), and the occasional mist spray for some hydration. 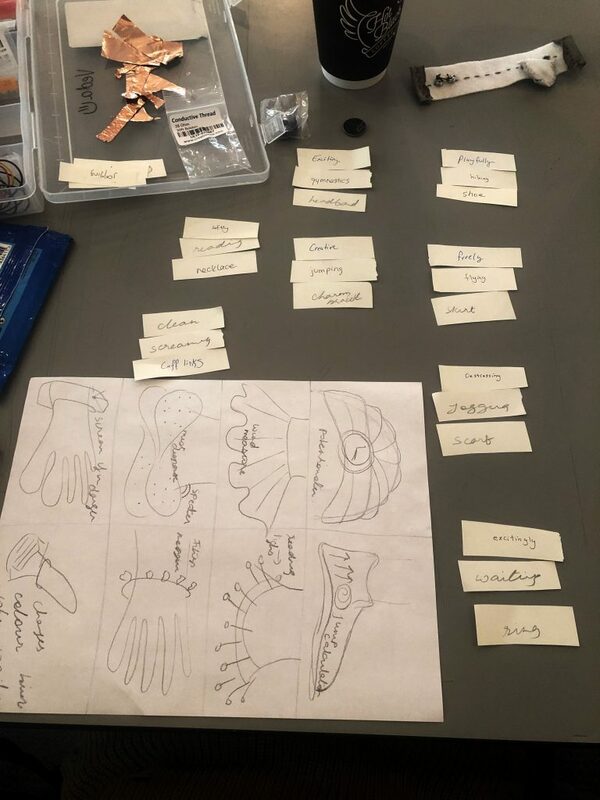 For this workshop, the focus was on building a prototype for the controller. The Relaxed Runners controller is worn as a single device with two controlling functions within it. Both controllers function as push buttons, that activate upon circuit completion, i.e. a combination of the power and ground lines. In the case of the finger socks, the mechanism is activated when the user joins both his fingers together. For the woven band, a user has to pinch two ends of the band together, with their other hand to activate the circuit. Both mechanisms work easily and are focused at users who are on the move with minimum interference. A thin scarf work on the neck is aimed at giving the runner a sense of security and not obstructing their movement. The functionality on the scarf works with the LED Lights and the mist spray. These are the most critical triggers for the controllers. The speaker can be activated before the run depending on the wearer’s decision to wear headphones or not. 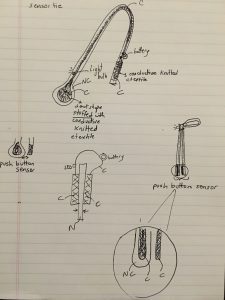 The idea for this controller was the outcome of an in-class exercise. We were asked to individually write on word cards, names of different types of clothing, verbs, and adverbs. After that, we had to combine these cards in groups of four and pick up random combinations in ballots. Then we had to sketch eight ideas each based on these combinations, and pick our favourite. Some of the combinations I got were softly-reading-necklace and exciting-gymanstics-headband. I chose a DESTRESSING – JOGGING – SCARF, and that formed the base of my idea. Given that building a high fidelity prototype for a scarf is unachievable in a short period is unrealistic, I opted to build the controller instead. The fact that this concept is targeted towards runners, any wearable device has to be light, easy to wear and extremely comfortable. It cannot interfere with the runner’s movement. With this in mind, I moved into execution. Knitting for lefties can be very challenging, as everything is inverse. After a substantial amount of trial and error, I found that Bill Souza’s Youtube channel is a great place to learn. As a first timer, I began the knitting process with a few sample patches. 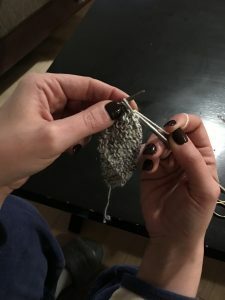 This experiment helped me get comfortable with the technique, the size of needles and the nature of knitting I wanted to execute. 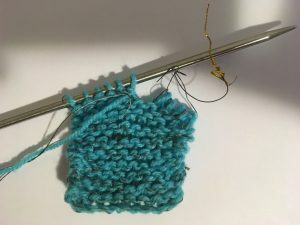 Usually, beginners are recommended thick needles because it makes the process easier to learn, but due to the tight timeline and nature of my prototype (it had to look good and fit on a finger), I consciously opted for thin needles. 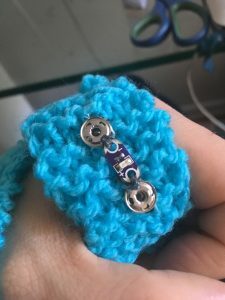 This decision worked in my favour because it gave me the right size of knit stitch, and the correct tension I needed for it to fit perfectly on any finger size. NOTE: Knitting requires a stitch count. I used a twelve-stitch count to fit the height of the more extended finger (middle finger) and an eight-stitch count for the thumb. 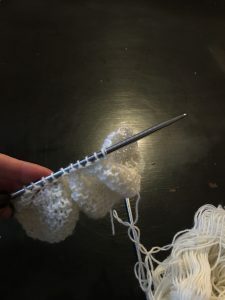 I began the knitting process just with yarn and added the conductive thread halfway through. 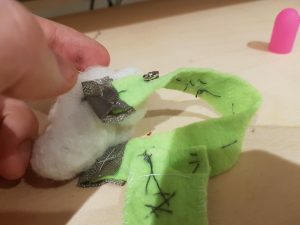 I wanted only a particular patch of the finger sock to be conductive, so the runner doesn’t accidentally trigger anything while moving. I just knotted the conductive thread onto the yarn and kept knitting. 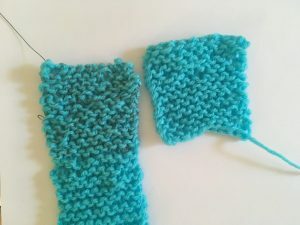 Once the thread is added, it might feel rougher and make the knitting process slightly harder, but continue as planned. 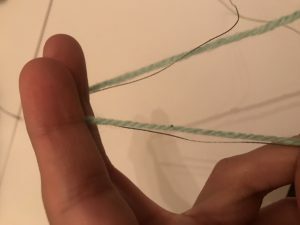 CAUTION; The conductive thread can tangle easily, and knots cannot be undone. Avoid cutting it off the roll you are working from and also avoid taking too much out at once. 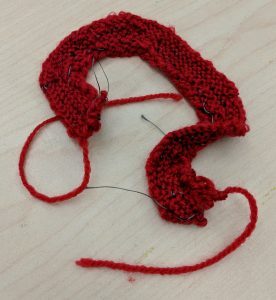 Once the conductive patch is complete, add another knot, cut off the edge and continue working with the yarn. Once completed, proceed with a bind off and trim off all extra thread. 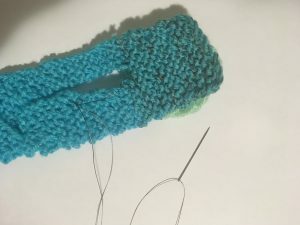 Once the patch is ready, hold the two edges together to form a cylinder, and insert a sponge in the middle to help maintain the shape of the sock. 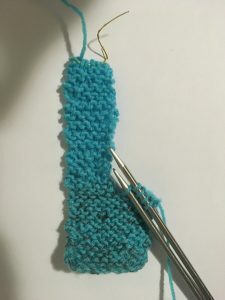 Use a regular needle and thread (preferably in a similar colour) to sew the two edges of the patch together to form the sock. Trim off all extra thread. Complete both fingers. 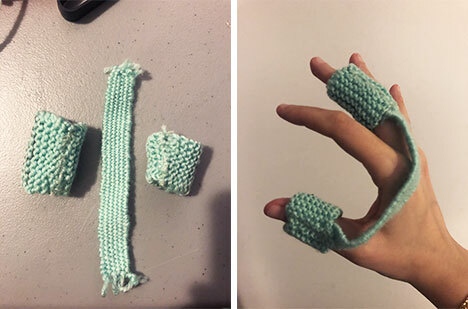 Once both the finger socks are ready, proceed to weave the band that joins the two together and also works as a controller. Start by making six same size incisions along the vertical edges of the cardboard patch. After that tie a knot at the beginning of your yarn and align it vertically along the incisions. The front should have them laid down vertically, and the back should have them laid out horizontally (pictures show how). 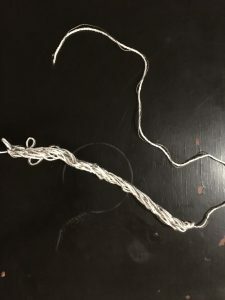 Conclude this part with another knot at the end of the yarn and trim off any extras. 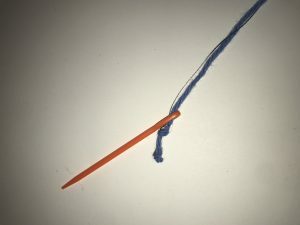 Next, cut a long piece of yarn and tie it to your needle. 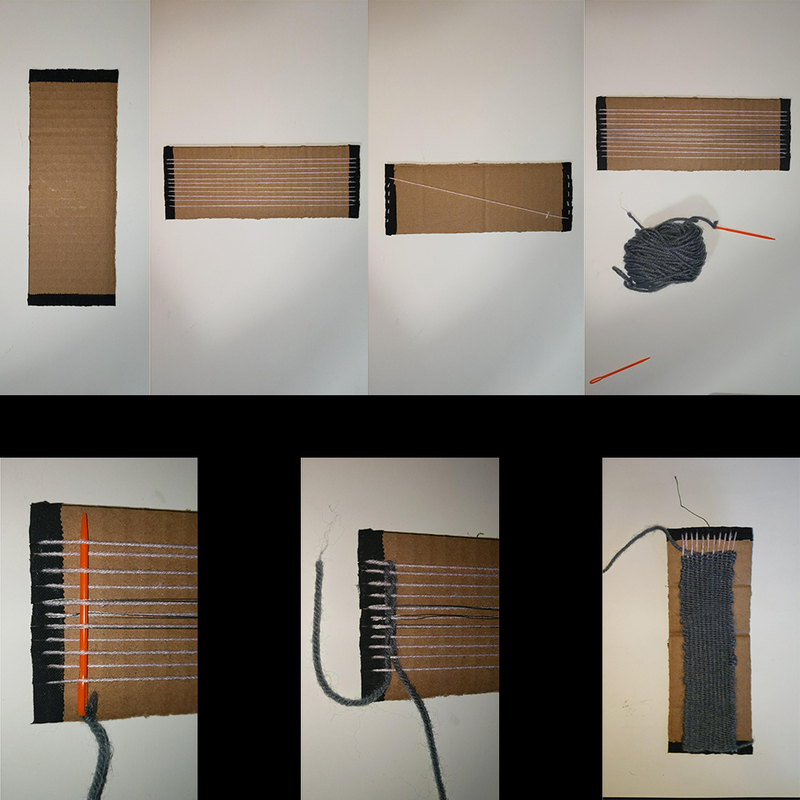 Begin moving perpendicularly to the vertical threads in an alternate pattern across threads and rows (pictures show how). Leave approx 1 inch on each end before you start the horizontal weave. Once a row ends move back in the opposite direction, and continue to do so till the end of the patch. Use the fork to tighten each row while weaving. 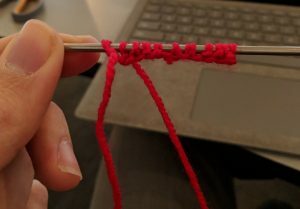 Linearly make multiple knots along the ends and trim off any extras. Once the weave is complete proceed to sew on the conductive thread onto it. Sew two same size patches closer to the ends of the patch, that can make contact with ease. You can choose any pattern you like for this. 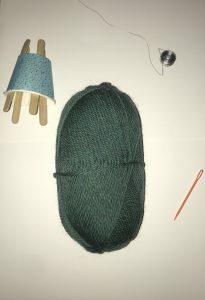 Once the three components are ready, sow the edges of the patch to the bottom end of the finger socks ensuring that the conductive areas on the socks align on the inside of the hand, and the patch outside (See picture). 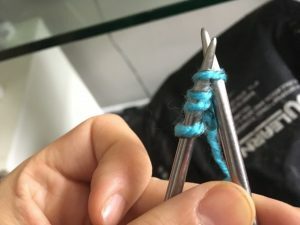 To test the finger socks, connect the edges of conductive areas to the edges of your e-textile tester with alligator clips. Joining both fingers should trigger the LED. 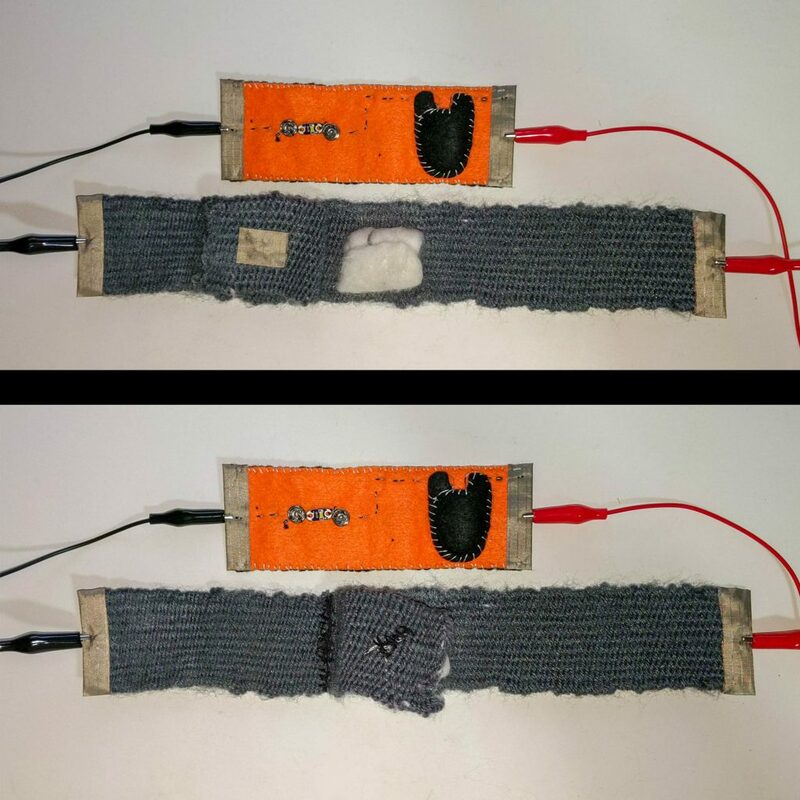 To test the band, connect the edges of the conductive patches to the edges of your e-textile tester with alligator clips. Joining both patches should trigger the LED. NOTE: Ensure that your battery is in the right poles prior to testing. This often causes the test to fail. Before this workshop, I had never knitted or woven in my life. This was a fascinating new world to venture into, and I’m so glad that I had the opportunity to learn both techniques. 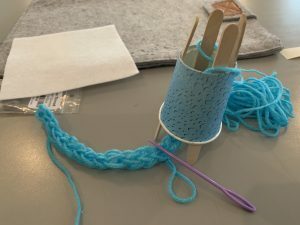 While felting also seemed like a good skill to acquire, because weaving and knitting both were more complex an technically demanding I wanted to use this opportunity to learn both. 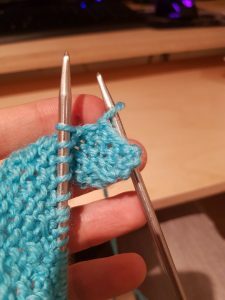 While the weaving process is agnostic to the hand of its user, knitting was an extremely challenging start for me as a left-hander. With limited resources available online it took me a few days to grasp the technique accurately, and that was the most challenging aspect of this project for me. Designing the controllers was not so much of an issue as much as mastering the technique with high-quality output. I almost gave up after day two, but I knew that this was the only opportunity I would have to pick up the skill, so I pushed myself, and I am pleased with the outcome. I would improve the quality of the sewing on the weave and perhaps make the band longer, so there’s more space to play. I would also like to try creating a more complex controller with all five fingers, using each finger to trigger a different kind of reaction. 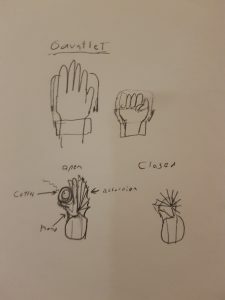 I would create a wrist band for my Arduino and attach it to the finger controllers, to improve the functionality of the prototype. These 2 creations are utilized using 2 different techniques. The 2 techniques explored are felting and crochet. My Intention with this project was to create something possible and futuristic. For the back pack light, I’m constantly looking for things in my bag and wanted to create a perfectly fitted insert. 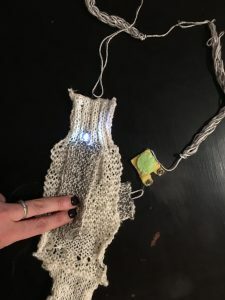 The button used to activate the light is crocheted with conductive thread. It is placed at the top of the bag where you naturally apply pressure when holding the opening of your bag. The second construct evolved from the ideation of what the most comfortable pants would look like. I discerned they would be electronic and could be used as a single piece of clothing that came all the way up to your collarbone. 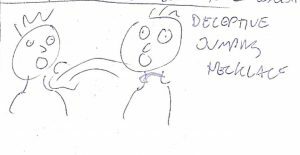 In my first draft of brainstorming, I didn’t really veer from my original ideation. 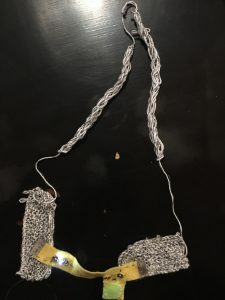 My process was mostly iterating on my original design and continuing with the exploration of the 2 techniques felting and crocheting with conductive thread. While crocheting the switch (button) that activates the LED light, I had to reconfigure the map of conductive thread. The distance from the battery to the LED was to extreme. Initially I could get the LED’s to turn on, but they were very dim and would not stay lit. I also doubled the batteries for each circuit. Each product had 2 -3 volt batteries attached for power. This was the case for both projects. Incorporating an area of felting was a much more stable means of conduction for the 2nd project. 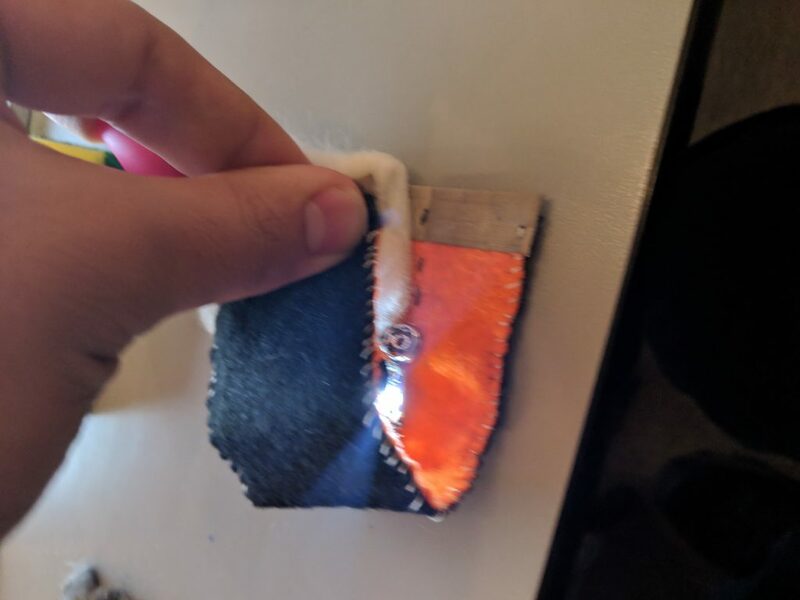 I created a thick neat line of felting to close the circuit to initiate the LED on the pants. If able to revisit this project at a later date I would like to expand on the fabric light and incorporate a lily pad. Making the product a little larger and brighter. Expanding on the brightness would increase visibility closer to the bottom of the backpack.. 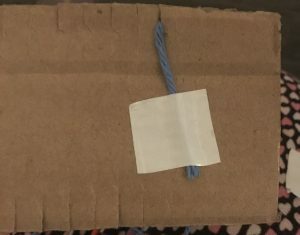 Connecting it to an outer design on the bag could be used for communication or sensing something harmful. Another variation could also be making the light as a matrix for images, messages. Through out this project I expanded on my use of e-textile buttons. This build allowed me to amplify my knowledge of trouble shooting with conductive thread. 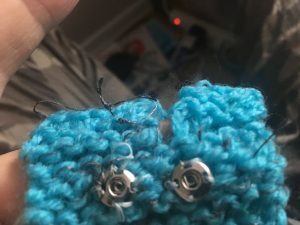 For example I discovered if I made circuits shorter or rethreaded some areas of the crocheted button I was able to redress the issue of closing the circuit more effectively. There are a vast amount of applications these fabric power switches could be applied to. They are definitely more effective when wieght and flexibility are the priority. 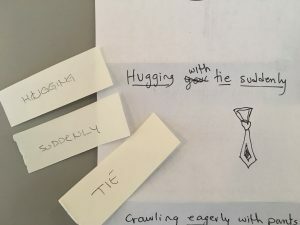 Through the ideation activity, I end up choosing the concept created with the words (tie, hugging, suddenly). I proposed to design an e-tie that is a hug sensor that measures pressure and intensity of hugging with others. 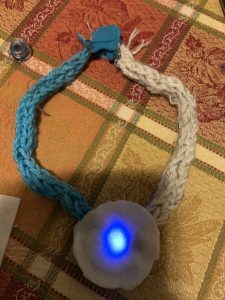 I created a push button sensor using knitting technique for creating this pressure activated accessory. 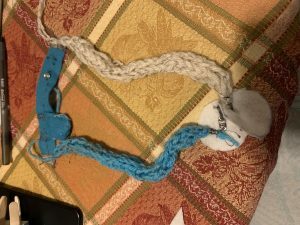 I Also used French knitting technique to create a conductive cord for the circuit. 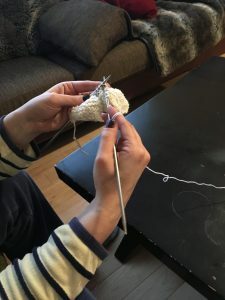 Learning knitting skills wasn’t an easy task, it required a lot of patience and accuracy. I followed video tutorials to learn beginner steps. I challenged myself and I tried many samples and repeated and practiced it until I got the hang of it. 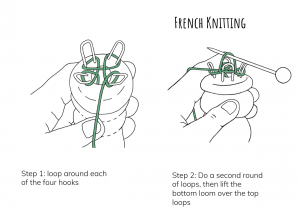 I struggled with French knitting a lot more. I had to practice without the conductive thread because it was causing a lot of tangling and very tight stitches. 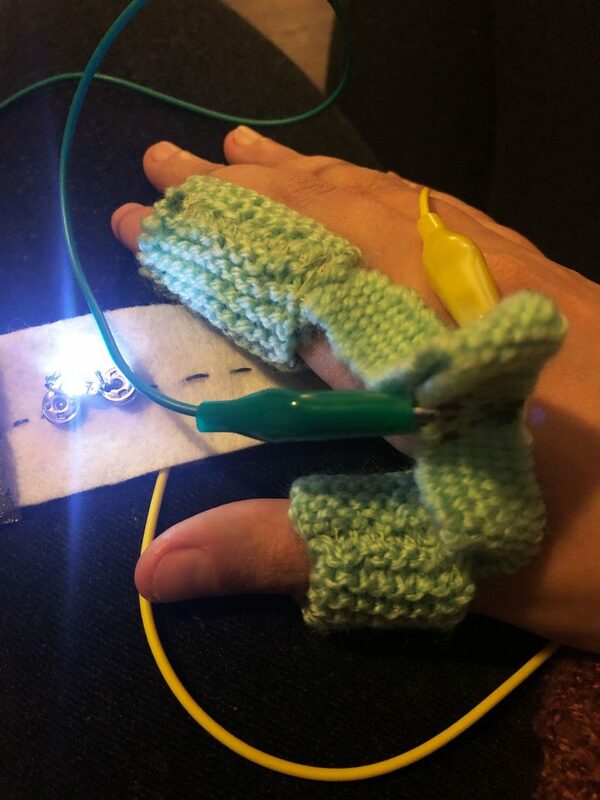 Afterwards, knitting with the conductive thread became possible. 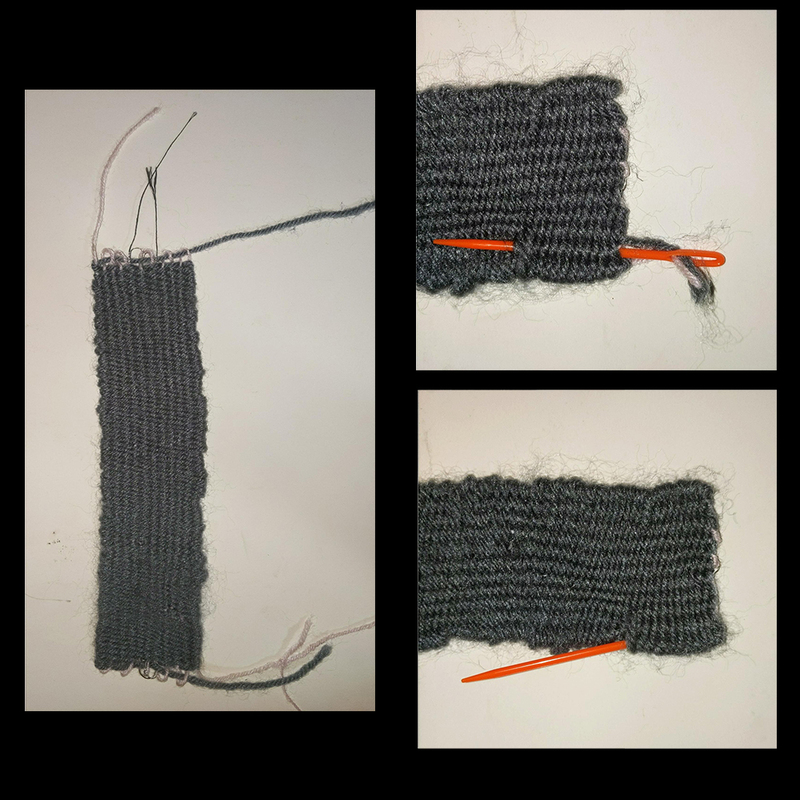 This experiment taught me not only knitting skills, but also how to knit a yarn with a conductive thread and treat them as one thread. 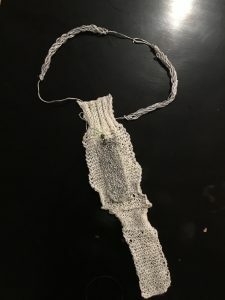 I explored different knitting techniques to produce different kinds of stitches, some of them were successful and some weren’t, but this resulted in creating an ironic textured patterned tie design. 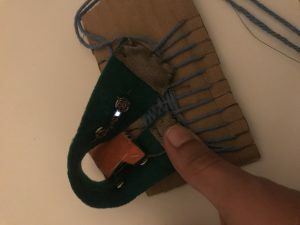 I learned also how to connect a circuit through many trials and errors and that made me understand short circuits, cut or non-conductive ones, closed circuits, and positive and negative sides of a battery in relation to the LED light in order to light it up. It’s my first time to work with electronics and all this information and findings are new to me. I will definitely do more projects with electronics and sensors, and apply this knowledge to create interactive interior environments for my thesis projects. 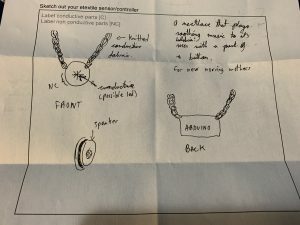 I would like to take this designed wearable accessory further and make it interactive through computation. I propose that the wearer can be able to control the intensity of physical contact with others. They can set the ideal pressure for a hug, and then if the hugger exceeds that limit, a special sound would be produced informing the hugger that a too tight squeezing hug is becoming unpleasant, so they will loosen up or break free. The sensor allows the wearer to feel comfortable knowing that a limit has been set and they’re in control of it. 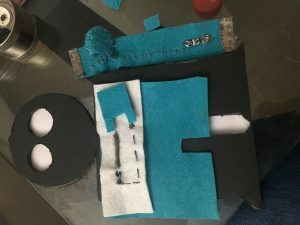 For the purpose of this experiment, I created two conductive controllers using yarn, felt and some conductive textiles. 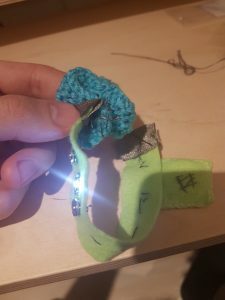 The prototype created is a battery operated bracelet with a felt button which turns the lights on. 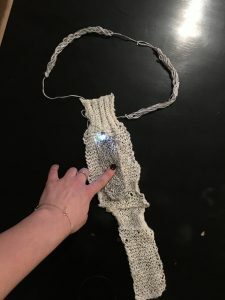 This is my first try with e-textiles so I wasn’t really sure what to expect. I noticed through the process that without resistors controlling the flow of electricity it was very easy to burn out a battery which made the process more tricky then expected. 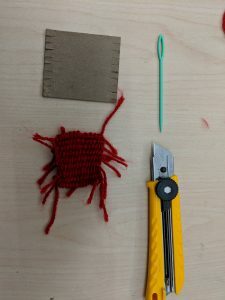 Here was my journey creating and testing an e-textile. 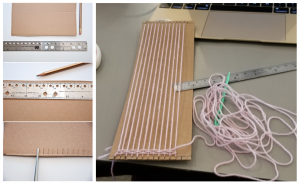 With the help of a tutorial from the weaving loom, I created a cardboard loom very quickly. I’ve never woven yarn before so I’m not sure how this holds up to a regular loom but I was really impressed how easy it was to make and how effective it was. 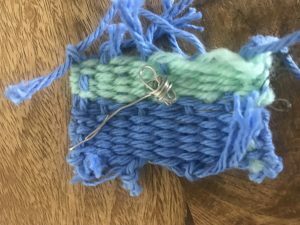 It didn’t take mush time at all for create the loom and begin weaving. The pattern of a weave is very simple as well, under and over. The only issue I ran into was keeping the shape of the band. 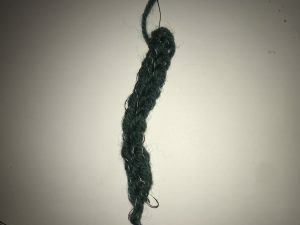 After a while I noticed that it was tapering in as I was weaving so I tried to loosen the yarn. 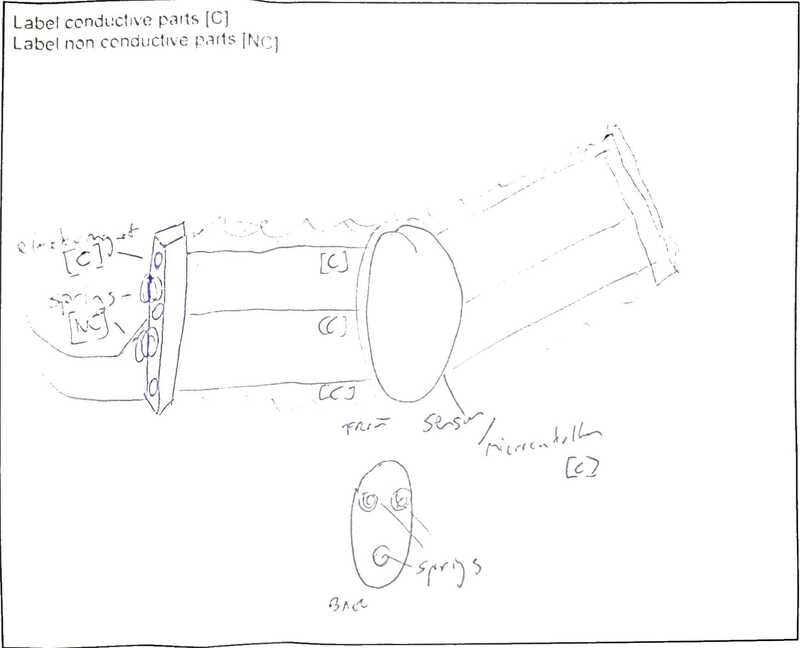 There needed to be two points of conductivity to flow electricity through the woven bracelet. Once I have about 3 centimetres woven I added the thread. 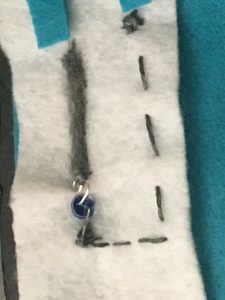 I left some space without conductive thread because I will be adding a felt ball/button later and I don’t want it sitting directly on top the circuit. I pulled the conductive thread all the way to the other end of the loom and tucked it in at both ends to keep it still. Once that was complete, I continued the weave until I reached the desired length. 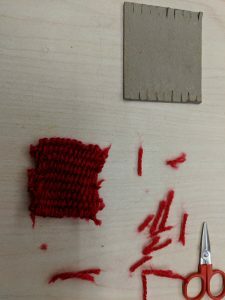 Creating the felted ball was an easy process but it is also very easy to poke yourself with the extremely sharp needle. Even with the finger protectors, I poked myself a few times. Go slow! Trust me on this. 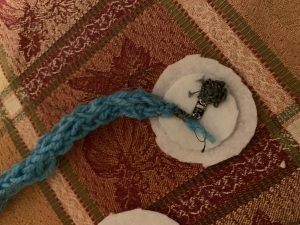 Since I was creating a button, I needed the conductive felt to be inside the ball so it would not trigger the bracelet until pressed. 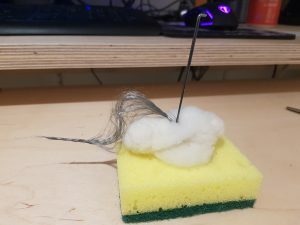 I started with laying the felt flat on the sponge (with the conductive piece on top) and started tapping the needle through. As I went I folded over the felt to create a ball and continued tapping the needle through. I made sure all the conductive felt stayed inside the ball while I was doing this. This was my first time using these kinds of LEDs so I quickly tested them all to make sure they worked before I sowed them in. 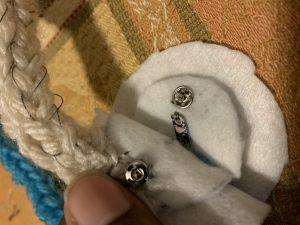 There was already two conductive threads running though the weave but I was worried it was not enough thread to seal the circuit. 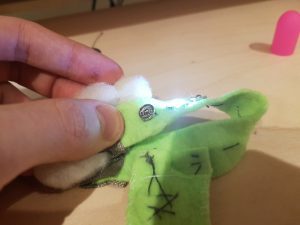 When it came to sowing in the LEDs, I kept a running line of thread through the positive line of lights and another running line through the negative line, making sure the 2 lines never touched. In the middle image you can see that I tucked the running line of conductive thread into the weave so it was hidden. 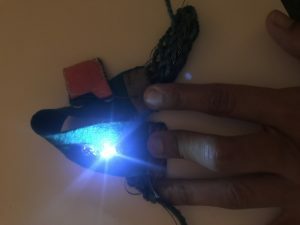 When it came to testing I was successful with the felted ball but not so much with the LEDs that were sown into the woven bracelet. Out of five LEDs, I was only able to get one of them to light. It was confusing why only one worked so I decided to try some trouble-shooting to see where I went wrong. 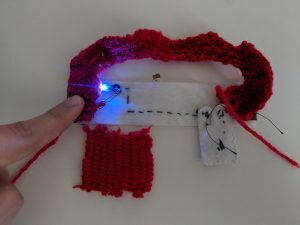 Using the e-textile testing tool I created, I check the connections through out the bracelet. When placing the tested lightly on top of the bracelet it light up right away. Since I had already tested all the LEDs before the sowing, I was really confused as to why the others weren’t lighting. 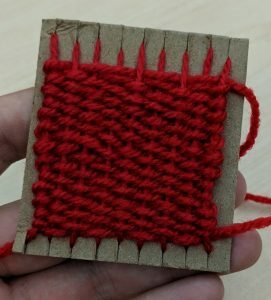 I loosened some parts of the weave to see what was happening with the connection points. It all seemed fine. I tried adding in some more conductive thread to strengthen the connection to the LED, no luck. Even though I wasn’t able to see figure out why only one LED worked I still wanted to finish up the prototype to see if it all worked together. I tucked all the loose yarn from the weaving process into the woven bracelet and trimmed all the excess. It was starting to look like a finished piece. I added a felt battery pack to the back of the bracelet and snapped it in place. Again, only one LED lit. Then I added in the felt ball to see of it would trigger the light. 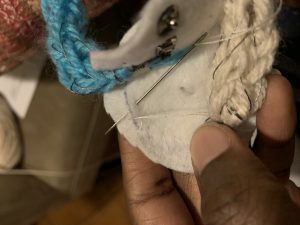 I inserted the positive thread into one side of the felt ball and the negative thread into the other side making sure they didn’t touch each other. Unfortunately, it sucked all the power from my battery almost immediately. After replacing the battery I tried again but I noticed that when the felt ball was connected it didn’t turn the light off. The light stayed on and then I pressed the felt ball it would turn the light off. This was the opposite effect that I wanted and it would drain my battery very quickly. The Smart Belt is the ideal belt for people who always find the time to have a nice meal even on a busy day. When you had too much food, and you fill like you need to make your belt a bit more loose to have that last bite, you don’t need to worry about it anymore. The moment the belt detect a bit of a force stretching it, the belt will automatically add to its length. My goal was to design a relaxing belt that is useful for eating. I thought about my personal experience with belts, and one thing that consistently came to my mind was how I wish my belt could sometimes automatically change its size. As a foot lover, I felt that this would be an ideal product. 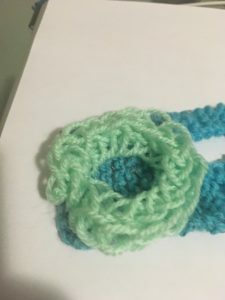 Initially, I wanted to create a long rectangular shape pompom, so that by pulling on the two sides of it, the resistance of it would decrease and would allow more current to pass through it. 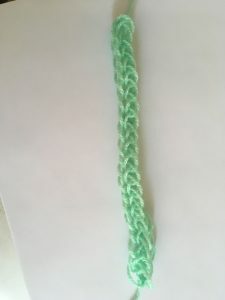 After my first attempt at creating a small pompom, I realized how time-consuming this would be, so I decided to weave the belt. 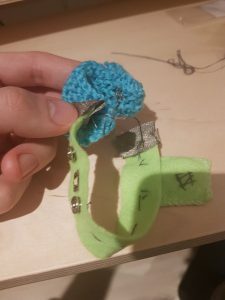 I created two long rectangular shape belt, place them on top of each other with a small amount of overlap, added a pompom between the overlapping area so that if you pull on the two sides of the belt, the pompom will allow current to pass through it allowing the mechanism to be activated. After the Crazy eights exercise the workshop, I decided to stick with my Smart Belt idea, as it required its own soft tech custom made sensor. 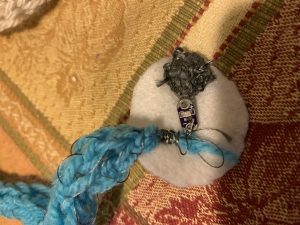 As I already mentioned in the strategy section, the initial idea of creating the whole thing using felting seemed too impractical, so the design was changed to a weaved belt, with a small pompom ball as a soft switch, that would be turned on if the two pieces of the belt were pulled upon. 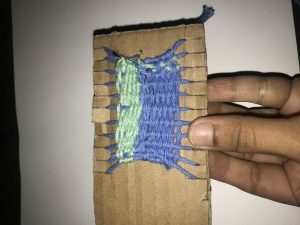 To start the weaving process, I created a loom out of cardboard to help me do so. I added a conductive thread to the three center lines so that I could later use it to conduct electricity to the pompom. 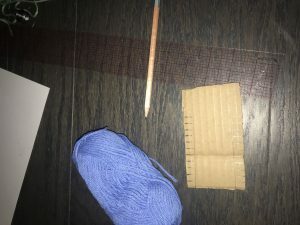 Then I took about 50 rounds of Yarn and started the weaving, One key point was that it was challenging to pass the 50 rounds of yarn through the loom every single row, so I ended up putting all the yarn around a small tube and used that to help me speed up the process. I started by going from the bottom and started going over and below from there. Left a small piece of yarn at the beginning to tie it up after the whole loom is done. After finishing the whole loom, you cut all the yarn that hold the piece to the loom. to finish the piece, you have to put all the extra yarns at the end into the piece itself. 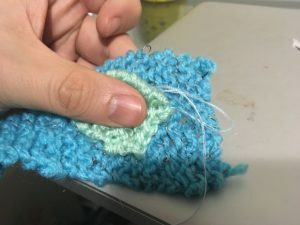 To do that, you insert the needle into the piece, put the extra bit of yarn in the needle and go into the piece itself. For the final touch, I used conductive thread to mark an X on the spot where the pompom is to be placed. Also added an extra bit of conductive thread to the edge of the product where the rest of the circuit is going to be connected. After finishing both of the pieces, I put them on top of each other and sewed them together. After finishing with the weaving, I started working on the pompom. 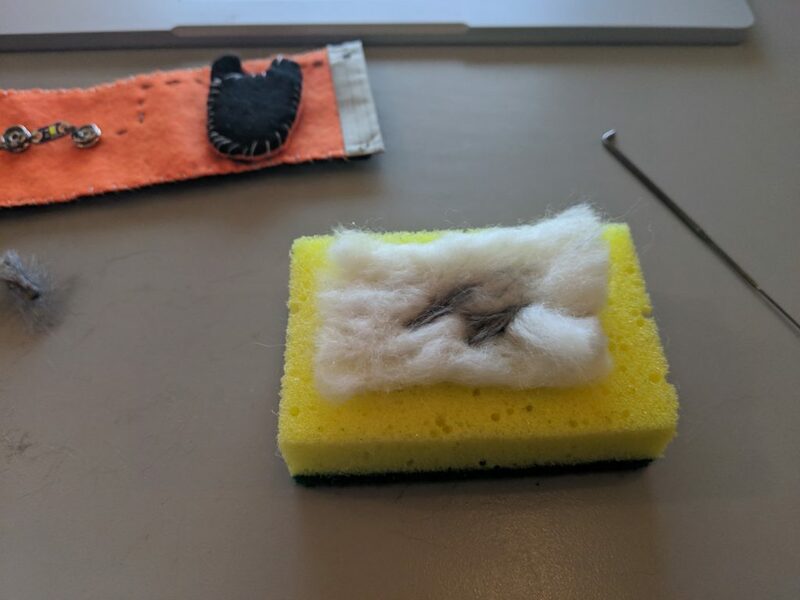 I cut the conductive fibre into small pieces and used felting to create the small pressure sensor. Every time I did a layer of conductive fibre, I added a layer of non-conductive material. Throughout the whole process, I had to constantly use of the testing tool to make sure the distribution of the conductive material was well done. I ended up with a pompom that was great in one direction but not in another, so I sewed the pompom on to one of the X marked on the belt so that the direction would stay the same. I finally did some testing by pulling the belt and seeing if it would turn the LED on the testing tool on. 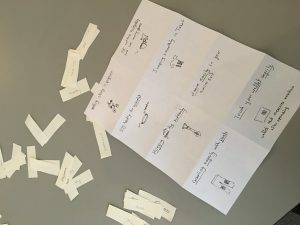 Insights: What knowledge did you gain from your prototype/ experiment? Don’t just include successes, your failures along the way are useful insights as well. How could you apply this knowledge? Weaving takes a lot of time, especially if you require long pieces. Having to pass a long piece of yarn every time through the loom is very difficult, especially when you need to make sure that no knots are being made. I did end up using a small roll of paper as the place holder for the yarn and passed that through the loom. Also, I initially made sure my loom was very flat and straight, but later on realized that the fact that I could fold my loom was very helpful especially when I had to pass the big roll of yarn through every single line. When you get the flow of the process, it gets much faster, but it is very difficult to make sure every line is exactly the same length. If you push the yarns too much if will narrow your piece and makes it more difficult to weave. To make sure every line stays the same size you need to push the yarn only enough to make sure everything is tightened together without ruining the rest fo your loom. The pressure sensor pompom requires a lot of testing. Even though I did a lot of testing while I was felting, it was still not enough. I only tested the pompom in one direction, so I ended up with a pompom that only worked in direction. 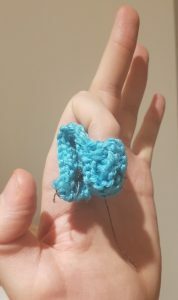 I would recommend that you make sure you test the pompom in every direction and that you don’t use long pieces of conductive fibre as that would reduce the quality of the pompom and change it to a simple switch. 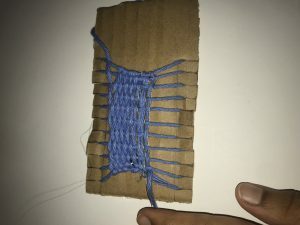 I used the Weaving Loom tutorial to create my own cardboard loom. I would also make it bigger so that it would actually fit around a person’s waist. I would also add a LED to the belt itself so that it would have an indicator on it to show its status. The task for our body-centric class this week was to develop a component or element for a conceived design using two instances of either felting, weaving or knitting techniques. In my case, I chose to pursue felting and knitting. 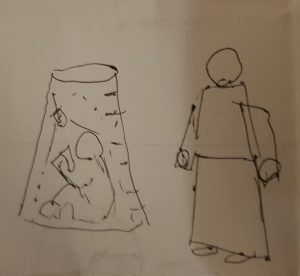 My initial design concept was to create a fabric dress that one could retreat inside for privacy; a wearable tent of sorts. 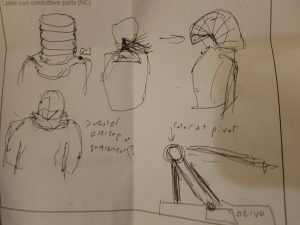 This concept simplified to a mechanically-retractable hood, then to gauntlets that could provide coverage depending on whether a hand was clenched or not. The devices I chose to design were to act as elements of the larger idea of realizing the gauntlet. As the glove would need to be activated in some sort of manner, I focused on developing switches activated through tension or compression. 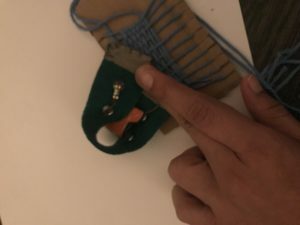 What resulted included a fingertip- activated pinch switch that could be integrated into an interior mitten to activate an external closure and a felt ‘stress ball’ activator that could be positioned within the palm to activate the gauntlet (and otherwise dangle like a pom-pom from the wrist). With my unfamiliarity with fabric circuitry, I wanted to keep my components relatively simple and base my designs off of examples shown in class. It was hard for me to envision any of the techniques as critical components to the design of the device as my heart was set on working with a fabric that could be easily cut to shape based on unrolled geometry from Rhinoceros, but having now worked with the materials and techniques in question I feel more confident in the potential to use and incorporate more analog methods into my concepts moving forward. 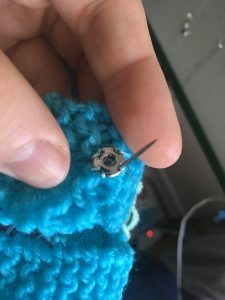 For the knitting component, I initially decided to make a knit button based on a design shown in class consisting of two conductive layers and a middle non-conductive layer, activated in compression. 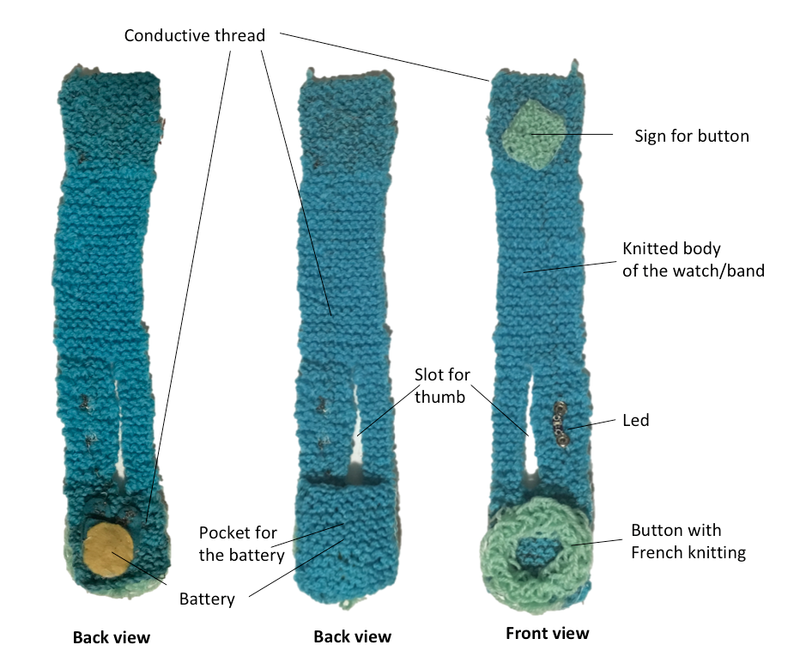 Consists of knitted yarn with sewn conductive thread integrated at the fingertip and ‘palm’ patch of the device. Tools include knitting needles, a conductivity testing device and a crochet hook. The last time I knitted was at least a decade ago. Familiarizing myself with the process again took a solid 30 minutes of watching a 10-minute YouTube tutorial. Becoming more comfortable with the process felt like a bit of a double-edged sword as I would occasionally forget where I was in the process of the technique if distracted or mindlessly repeating the loops. But I picked it up the next day and watched 2001: A Space Odyssey for the first time… which is possibly the best film to watch in the middle of knitting. The knits went smoothly, but slowly. Thanks to my incredible character trait of laziness I imagined ways that I could create something interesting with the small piece I eventually would cast off. 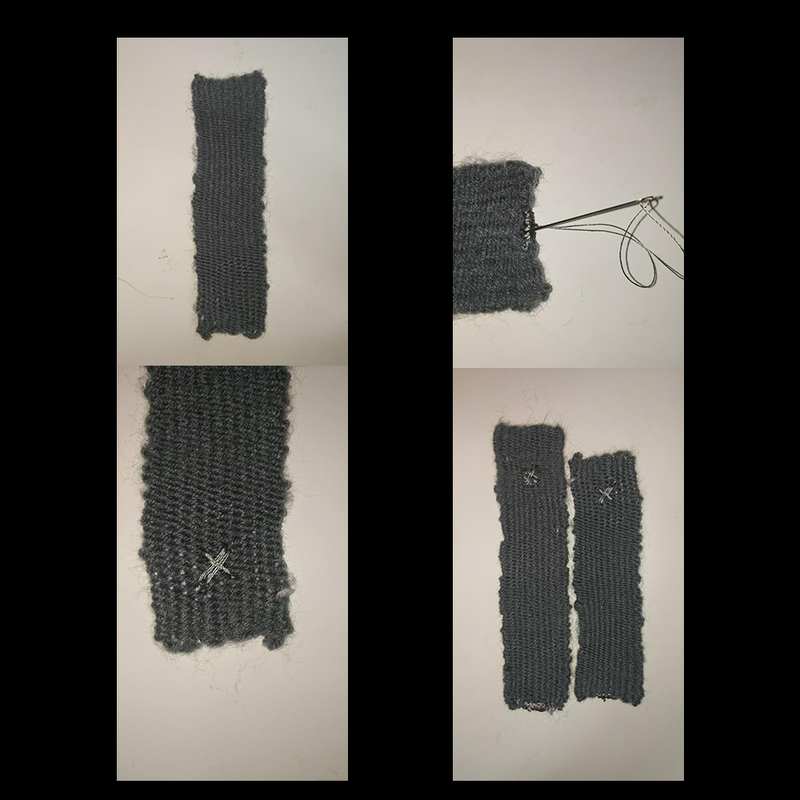 One of the first ideas that came to mind was to attach a second element to the midsection of the strip and create a pinch switch activated when the three extensions of this material would be in tension. 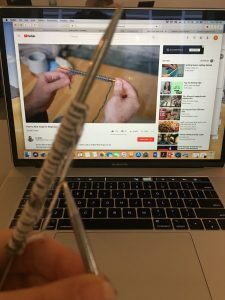 This led me to look up how knitted pieces could be attached after being cast off, which turned out easiest with a crochet hook. 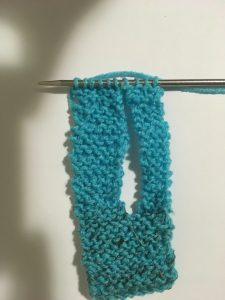 This in turn inspired me to consider using the existing knit strip over top my fingertip; I wouldn’t have to create an extra piece and could use the tip as a component in a pinch switch. Maybe if I had the foresight I would’ve sewn the conductive thread into the knit material prior to knitting the conductive elements but a simple star-sewn patch did the job suitably for prototyping purposes. With the felting process I decided to create a simple pinch pom-pom based on the examples. Why not just activate the gloves with a ‘stress ball’? The idea to dangle it from the sleeve of a coat or the device came later. 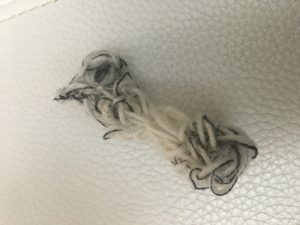 Felt two ends of the white wool, leaving the centre unfelted. 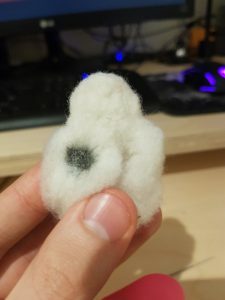 Poke a hole through the middle with your finger, then apply half of the conductive wool via felting in the two unfelted parts of the white wool. 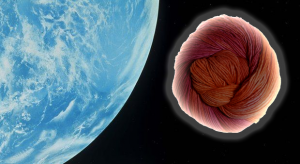 Felt the remaining wool, being sure not to connect the two patches of conductive wool together, until you create a sufficiently firm sphere. 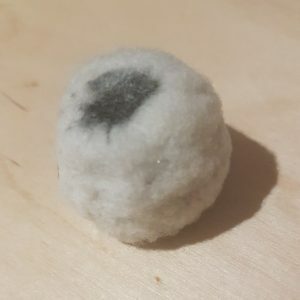 I stabbed a puffy ball of wool with a felting needle until it firmed up on both ends, then established conductive felting on both sides of the midsection of the woolly ball. I tested the device to see if it worked throughout the process; definitely most effective when fully compressed properly based on the manner I injected the conductive thread. Squish-n-go! 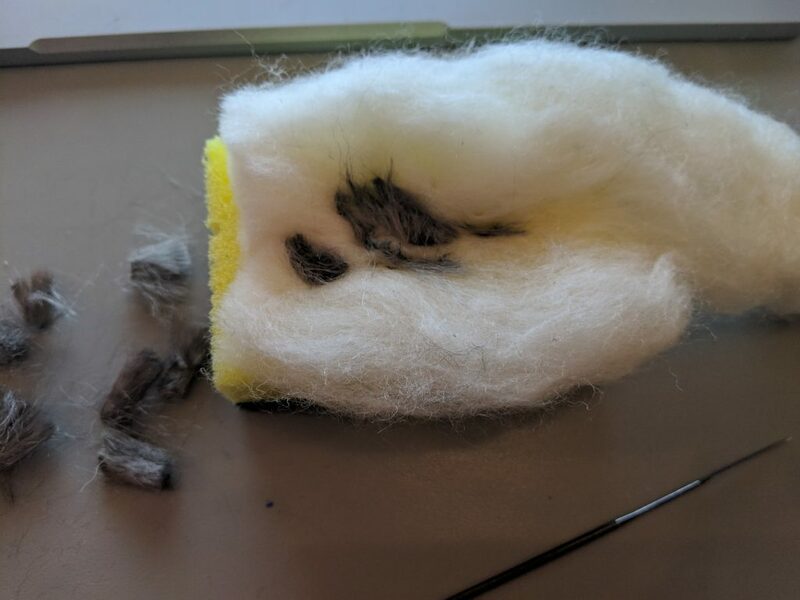 I would be interested in trying again but with the conductive thread intermingled throughout the entirety of the wool in the future but I wanted to go with a design that I knew would work for my first attempt at felting. 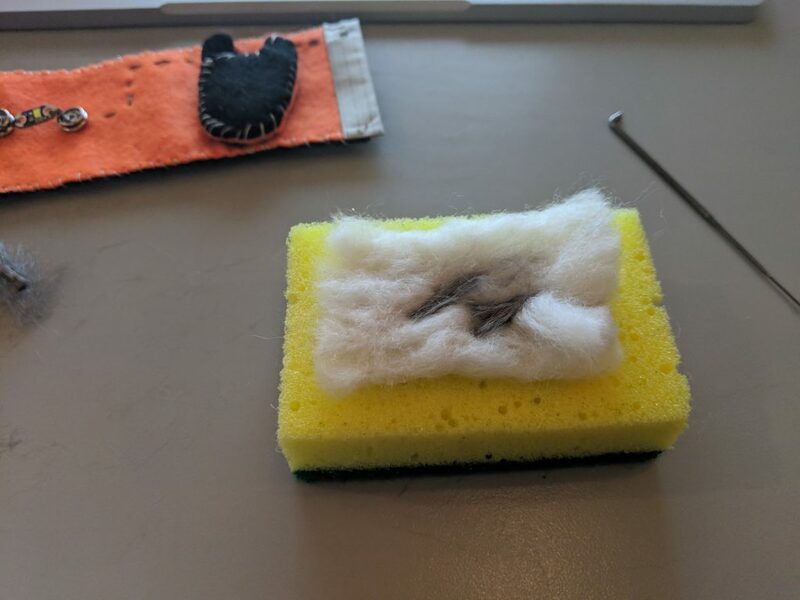 The method seems very effective as a means of concealing the circuitry as the felt seems very accommodating to the potential of it being stuffed with logic chips or the like (I would have to test how effective of an insulator the wool is and whether I could make it accessible for repair). Working with these techniques took me out of The Comfort Zone and into a realm I have always been excited and interested in but never brave enough to summon the initiative and work with. In addition to lecture notes provided by our instructors, I reviewed the following YouTube tutorials to learn how to do the techniques used in these devices.